Once you experience loose stools/diarrhea, add up the total daily dose and reduce the number of tablets by approximately 25%. If your total daily dose was 10 tablets then 25% of this is 2.5 tablets. You should round up to 3 and take 7 tablets throughout the day. When you experience loose stools again, add up the daily dose, reduce by 25% again. When you get down to the number of tablets you require of Magnesium Glycinate tablets you will take this amount, ensure you take several at bedtime. Green vegetables such as spinach are good sources of magnesium because the center of the chlorophyll molecule (which gives green vegetables their color) contains magnesium. 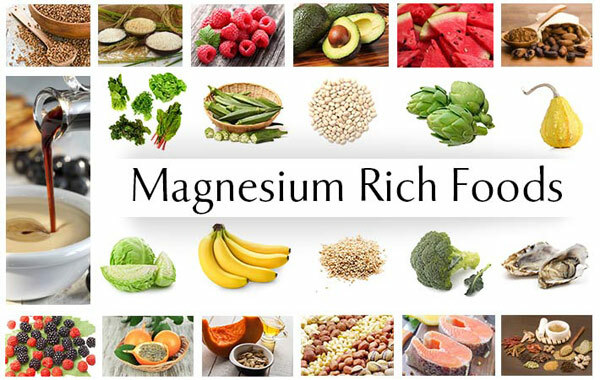 Some legumes (beans and peas), nuts and seeds, and whole, unrefined grains are also good sources of magnesium. Refined grains are generally low in magnesium. When white flour is refined and processed, the magnesium-rich germ and bran are removed. Bread made from whole grain wheat flour provides more magnesium than bread made from white refined flour. Tap water can be a source of magnesium, but the amount varies according to the water supply. Water that naturally contains more minerals is described as “hard”. “Hard” water contains more magnesium than “soft” water. *DV = Daily Value. DVs are reference numbers developed by the Food and Drug Administration (FDA) to help consumers determine if a food contains a lot or a little of a specific nutrient. The DV for magnesium is 400 milligrams (mg). Most food labels do not list a food’s magnesium content. The percent DV (%DV) listed on the table above indicates the percentage of the DV provided in one serving. A food providing 5% of the DV or less per serving is a low source while a food that provides 10-19% of the DV is a good source. A food that provides 20% or more of the DV is high in that nutrient. It is important to remember that foods that provide lower percentages of the DV also contribute to a healthful diet.